Dion comes back with a steaming cup of tea in a thin, vintage china pot with an intricate burnt orange flower pattern on it. When I complement him on his assemblage and want to know, what makes an item interesting for him, he smiles almost coy: “Well, you know I think that there are background objects that can be less specific and are more about creating a scene or creating ambiance, and then there are foreground objects that have to take on the burden of meaning. His cheeks are glowing as he rushes over into the living room to another vitrine to look for more treasures. As he crosses over he stops dead at the couch on which the dog made herself comfortable. “Hera, you look a bit chilly, I think you need a blanket.” He takes the off-white wool blanket from the arm rest and folds it around the slightly shivering dog who snuggles her head right into it. “She’s a whippet and this is how she spends most of her day.” Leaving Hera to her nap, we move on to the next object of interest: a 3D-print of a fish. It’s a small model of one of his recent projects, a public sculpture in Stavoren, Netherlands. Now completely in his element he walks me through the whole process of how this piece came about. From his first red and blue sketches – he mostly sketches projects in red and blue crayons – over a computer model, to a 3D printed version, to the final massive fish fountain positioned in the center of town. “You know the public was not so crazy about this. They were like ‘Uh this is like Disney Land, you're bringing your American imperial Disney sensibility to Holland.’ And I said ‘Trust me.’ And of course now everybody loves it, but you have to go through this process. It’s a lot of negotiation. 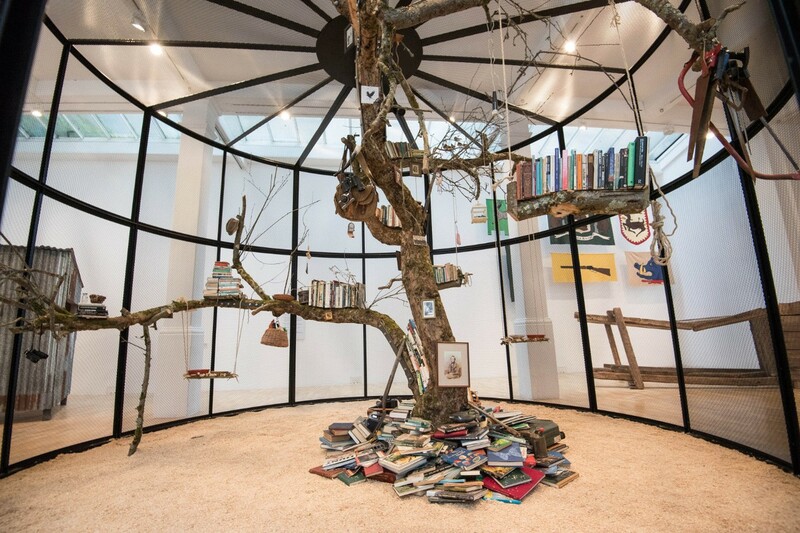 Nature and the discourse of how we try to preserve it, has been a part of Mark Dion’s work for a long time. One of his famous pieces “Mobile Wilderness Unit” is part of the “Wilderness” exhibition at SCHIRN until February 2019. It is composed of a stuffed wolf, standing on an open trailer decorated with materials representing the wolf’s natural habitat like twigs and grass. “You know the term wilderness is really problematic, right. It’s one of the terms that people in conservation, in land protection argue, think, and write about. There is this famous William Cronon piece, ‘The Trouble with Wilderness’, which is a central piece for thinking about these ideas. We’re living in times where cities are consolidating the population, the countryside is de-populating. Those of us who are interested in protecting wild things and places know if people don't have contact with them they will never fight for them. If you don't know an elephant, or see an elephant in his place why would you care if elephants are protected or not. This causes kind of a conundrum – and there is no real solution to this: Do we take people out of the city to the wilderness? Do we take the wilderness to people? So, this piece is in a humorous way engaging that sort of dialogue, that one could pull this wagon about and introduce people to a wolf in its natural habitat. It’s a little bit of a critique of the idea that to just introduce people to the wild is going to be enough to make them care. Like all of my work it’s quite melancholy, but tempers that with humor.” Does he think that wilderness is a topic that will play a role in art projects in the future? Dion’s work has always been critical not only of how we choose to present nature, but also how we choose to preserve it. And he enjoys a dialogue with the public about these and other questions, working for various public art projects himself. His latest piece, “Cabinet of Wonder,” is a large cabinet of curiosities completely designed and filled with life by Dion for the “Gathering Place”, a public park and art program in Tulsa, Oklahoma. Read Part 1 of the visit to Mark Dion’s cabinet of wonders. 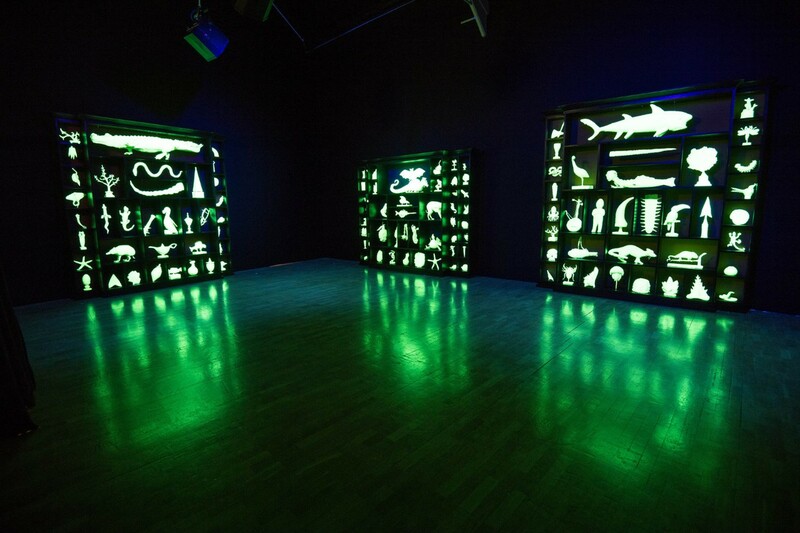 More about Mark Dion’s art in the SCHIRN PODCAST on the WILDERNESS exhibition. The WILDERNESS exhibition is on view until 3 February 2019.